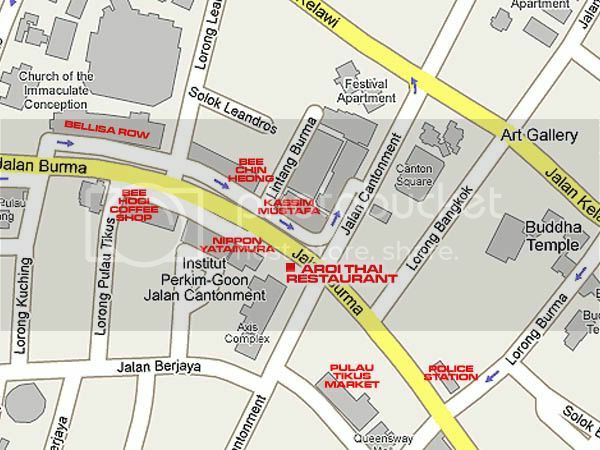 Note: The restaurant has shifted to a bigger and more comfortable corner shoplot a few shops away. For the past two weeks or so, we had quite many restaurants/cafes opening in Penang starting with OldTown White Coffee at Penang Times Square in mid May to Palm Village Café on Sunday. The latest would be Aroi Thai Restaurant yesterday in Pulau Tikus, Penang. The restaurant had a simple layout without much fuss over having too many authentic Thai displays within the premises. It’s simple and yet comfortable for your dining experience with their cooks all the way from Thailand. Basically, the food choices here were not as spicy and hot as the ones you would get from Thailand. Since it was just their first day of operation, I would think that they were still adjusting their ingredients usage to cater to the general taste buds of the locals. Let me share with you my experiences in this restaurant so that you could judge them with your own verdict. As usual, I would start with the most basic dish in any restaurants just to know them better. 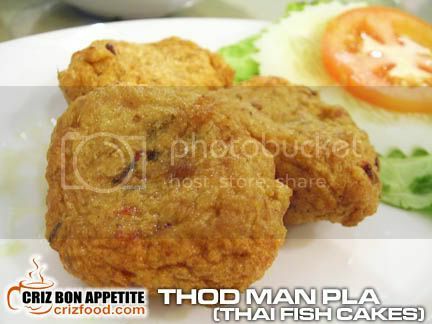 The first dish that came was the Thod Man Pla (Thai Fish Cake – RM3.50 each). These were quite nice combined with the Thai chili sauce and plum sauce that were served except that I felt they should have added in some chopped long beans for that extra bite. 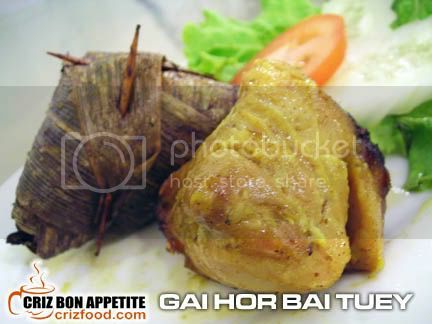 The next dish was the Gai Hor Bai Tuey (Spicy Chicken Wrapped in Screwpine Leaves). The chicken meat maintained the moisture within and was almost perfect with the fragrance coming out from the screwpine leaves (pandan). The spices used were just nice but why the almost perfect judgment? Well, it was delicious but it lacked something that would boost up the fragrance – bird’s eye chili (cili padi). A piece of that tiny and yet fury chili per wrap would surely make the dish taste better. 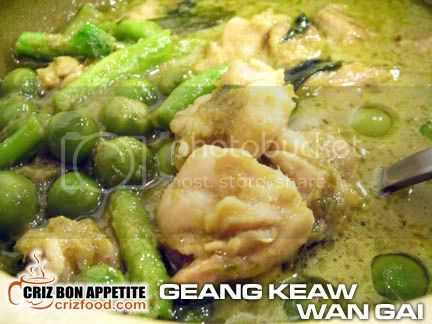 The Geang Keaw Wan Gai (Green Curry Chicken – RM10.90) would always be my favorite in any Thai restaurant and the dish here indeed tasted great. Although I did ask for a milder version without too much of hotness and lesser Thai basil, the dish came out as my favorite. It was obvious that the ingredients used were freshly blended and the chicken slices added were real tender. Moreover, the chef did a good job in getting the long beans and makhuea pra (Thai aubergine) simmered to the right texture. They were soft enough compared to those harder ones I normally get from other Thai restaurants. This is surely a great dish to be taken with steaming hot rice. The Goong Si-Da (Steamed Prawns with Spicy Salad – RM17.90) had so many freshly steamed prawns that I could barely remember how many I took. LOL! Actually, the dish had 11 medium sized prawns (I wondered why they did not make it to a dozen. :P). 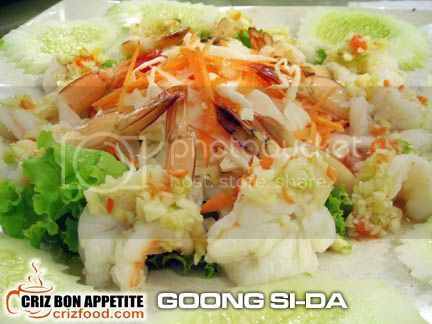 Each prawn had a mixture of some chopped fresh garlic and chilies, accompanied with some fresh greens slices such as carrots and cabbages, glazed above a bed of fresh lettuce. The sauce itself had some hint of fish sauce and lime juice. Although the prawns were fresh and the whole dish were pungent (due to the hidden hotness from chopped garlic and chilies), the sauce was rather sour. Maybe a pinch of brown Castrol sugar with some added sliced kaffir lime leaves would give the dish a better boost. To me, the salad did not look or taste much like anything from Thai at all. Moreover, I think the cook forgot to garnish some mint leaves on the salad as in their menu. That would have brought out some extra flavor for the dish. Instead of ordering the normal Thai fried rice, I did try out their Phad Thai Kia Hor Goong (Fried Thai Rice Noodles with Prawns – RM9.90). The noodles were fried with some bean spouts, bean curd cubes, onions and prawns. It came with some side dishes such as fresh bean sprouts, Chinese chives (ku chai), crushed peanuts, chili powder and a slice of lime with a beaten egg served above the noodles. Somehow I found the dish lacked the wok hei (high heat cooking) and the cook made a mistake of adding too much sugar in the noodles. Normally, I would get some sugar served beside the noodles in most restaurants. I hope the restaurant would look into this minor hiccup for those who do not like to have over sweet stuff. 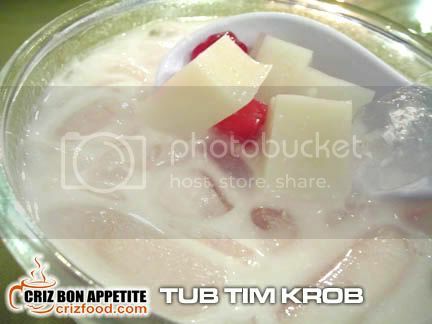 A Thai meal would not be complete without trying out their Tub Tim Krob (Jellied Water Chestnut with Coconut Milk – RM4.50) as dessert. To my disappointment, it came with almond jelly cubes instead of the normal jackfruit slices I had expected. The water chestnuts were harshly cut and the coconut milk was rather diluted. The whole combination of ingredients was rather inappropriate as I felt that it was rather bland without the unique fragrance from the supposed-to-be-given jackfruits. 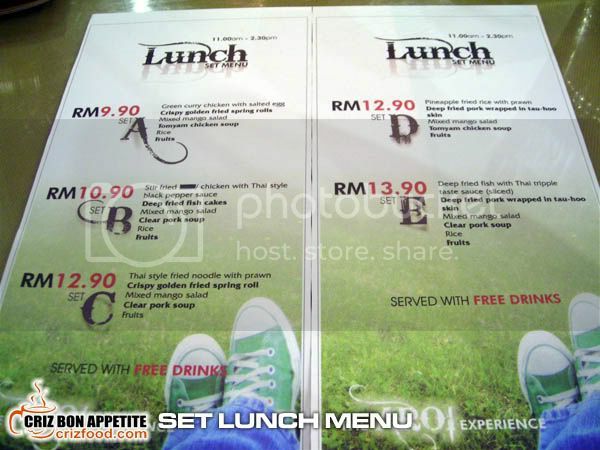 Other than the ala carte dishes, you can even try out their set lunch meals from as low as RM9.90 which would come with fresh fruit and free drinks. Click to enlarge the menu below. If you are coming from Jalan Burma into Pulau Tikus district, you would see a police station on your right. Drive on until you have reached the Jalan Cantonment/Jalan Burma traffic light. After the traffic light, you would see a row of shop houses on your left. The restaurant is just along this row of shop houses, between Soon Huat fruit and praying material shop and a nasi kandar shop. Parking can be quite limited during office hours and weekends. You can either try finding some behind the restaurant or opposite along Belissa Row. If not you can try finding some parking opposite the restaurant at Lintang Burma (between Bee Chin Hiang and Kassim Mustafa). The worst alternative would be within the Bandar Baru Supermarket car park along Jalan Cantonment and walk back to the restaurant. Branch Address: 387, Jalan Burma, 10350 Penang, Malaysia. wow, another new Thai restaurant…my fav….sure will go when i visit Penang. Excellent news! There can never be enough Thai restaurants to go around! Parking at Bandar Baru supermarket is the best bet, I think! Well, I still missed those authentic ones from Thailand. Somehow I could not find one here in Penang. Maybe it’s rather hard to get certain ingredients locally. You sure can eat a lot Mary. LOL! good .. very near my workplace!! Well, actually I lost weight running around. LOL! reasonably priced-like the green curry. Interested to try out their set lunch 🙂 Is it available during weekend? the green curry looks good! but hw come desserts so bad ahh..
Well, I would say it was a rush opening. They should have considered on the availability of certain ingredients. Green Curry, Fish Cake, Pandan Chicken and Tub Tim. Safe choices and usually will not fail. Too bad for the Tub Tim. Yea.. that was the let down of the whole meal. Anyway, it should be a small matter to them to change to the demand of their customers. What a joke Steven! So when will we get Steven Goh’s Tea Garden?? LOL!! wah, so many invitation in one weekend ah? erm…hard to get good phad thai in penang. can introduce some? No harm trying out good food! I’m sure they will find ways to adjust and suit the taste buds of Penangites! Hey many have tried and planning to revisit so why wait la? Let’s go to AROI! Are you treating then Ong?? LOL! I have tried and to my surprise they sure taste excellent. Even my grandma gave a thumbs up. Well? What’s holding your legs? Aroi means Oiishi in japanese and good taste in plain simple English. Cheers! Thanks for sharing the meaning of อร่อย with us. It’s indeed delicious or tasty. ขอบคุณครับ Thank you. looks good…from the environment to the dishes. Thanks for sharing! Yeah, I tried that last week and the food was pretty good though a bit pricey for some of the dishes. The roasted pork leg (RM25) was good but still cannot beat my favorite, i.e. the “choo char” at Lucky 99 on Lembah Permai which is much bigger and cheaper at only RM15! Tender yet crispy. Simply the best crispy pork leg I’ve tasted! Well, I have to admit some of the food are good but my family found the place a bit overpriced for the amount of food served.